Andrea Fraser’s Untitled series stems from a project she completed in 1984, which consisted of a collection of slides superimposing images of Old Masters’ works with those of well known 20th century artists. Having reconstructed these images as photographs, pieces such as Untitled (de Kooning/Raphael) #1 examine the polemics of feminism, historical revisionism, and artistic authenticity. 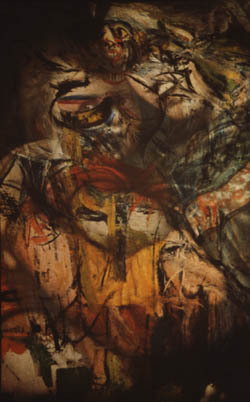 Here, traces of De Kooning’s violently rendered figure scars the beatific Madonna and Child, merging the two disparate examples of the subjectification of women in art history as a Frankenstein-ish amalgamation. Printed in poster size, Fraser highlights issues of sexual commodification and image consumption. 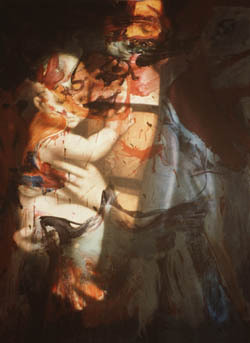 In Andrea Fraser’s Untitled (de Kooning/Raphael) #2, The Seated Madonna and De Kooning’s expressionistic figure synthesise to become almost indistinguishable; the brutal modern abstraction making the cherubic icon appear charred and battle worn. Presented as a second generation photographic image, Fraser’s Untitled loses the painterly detail of the original masterpieces, transforming the aura of artistic integrity to the mechanised and fetishistic language of media. Through her act of appropriation, Fraser explores the exclusive nature artistic lineage, writing herself into the legacy whilst simultaneously critiquing its historical bias. Short History of Performance Art, Part II"